I was carpooling to school the other day with a few kids and watched one of the boys totally entranced with a piece of paper and a pair of scissors. It instantly reminded me of that kid’s really do love the simple things. We don’t need iPads and computer games and RC vehicles to keep kids enthralled and amused. All it took was a simple piece of paper and a pair of yellow plastic child proof scissors. Every one else in the car wanted to see his inventive creations. When I logged in later that night and popped over to The Land of Nod, I knew I had found some perfect birthday party gifts and stocking stuffers. They had the perfect balance of keeping it simple but making it super cool. Over at The Land of Nod I found these Kids Crafts: Play Paper Snowflakes (a.k.a. sheets of fancy paper) and these cool Kids Arts: Fancy Half Circle Zig Zag Scissors. These will be great for my son’s art table and I am going to stock up because I know they will make great birthday gifts for boys and girls alike. My son is in kindergarten now and loves cutting paper into various shapes. If I am going to have little scraps all over the floor, I figure they might as well be cute and colorful. So come join me and stock up on some new art supplies today. I am so excited about Minted’s new line of party decor! These decorations are fabulous. There are a number of themes and holidays to choose from so you can find the perfect items for your event. From baby showers and birthday parties to Halloween, Thanksgiving and Christmas celebrations – you will find a wonderful selection of decorations to make your party one of a kind. I know that there are a number of you out there who have the time, energy and creative know-how to make wonderful DIY decorations, but then there are the rest of us who like to leave it up to the pros. At Minted, independent designers have done all of the heavy lifting and all we need to do is place our orders. The most important part of any party is the guest list. With great friends and family – you really don’t need much else (except for yummy cupcakes). But after people (and food! ), what truly makes events of any size extra special are the little details. Minted’s party decor includes everything from personalized bunting banners, cupcake toppers, favor bags, table confetti, signage, stickers, plates, napkins, crowns, centerpieces and more. They have thought of everything and you can buy them all together in different party packages. They are adding more party themes regularly so check back often. Of course you’ll be able to order your chic invitations too. 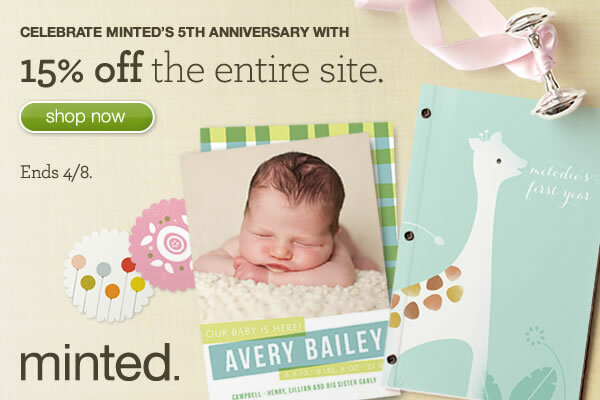 SAVE 10% and receive FREE shipping at Minted until 10/31/12 with promo code SWEETPEA12. I don’t know about you but I always find myself day dreaming about our next family vacation. I think my son will actually be able to survive a longer flight now that he has his iPad fully loaded with games and movies. I want him to see the world – just like I did as a kid. I have my fingers crossed that our next family vacation will be FREE. Join me in entering this simple contest to win a FREE Vacation! 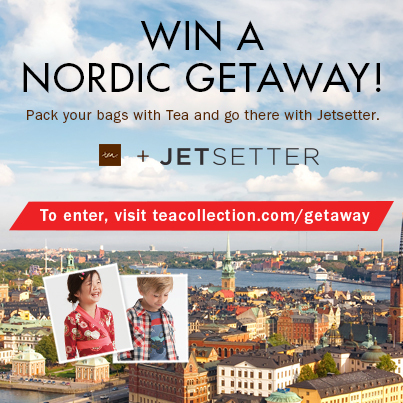 Tea Collection has partnered with Jetsetter and is offering you the chance to win a Nordic Getaway + a Tea Collection gift certificate to pack your suitcase full of super cute Tea clothes for you and the kids. What a perfect combination! I have visted Denmark, FInland, Norway and Sweden (and of course would love to add Iceland to my list too) and I have to tell you they were all absolutely wonderful. So many Americans think that Europe consists of Paris, London, Rome and Barcelona. They don’t even think the venture beyond those famous cities. Scandinavia is spectacular! I know I am a little biased since I am half Swedish, but they are simply gorgeous countries with friendly people and spectacular sites to see (and great shopping too!). The last few years we have been to so many fabulous Halloween parties. Since there isn’t a single parent in town who would send their children down our very long, very dark driveway for a Twix bar, we are usually on the top of everyone’s list for Halloween fun since they know we don’t need to hand out candy at home. It works for me. Sweet Peas & Stilettos loves PLUSH and not just because they are giving away a FREE Petunia Pickle Bottom Diaper Bag to one lucky Sweet Peas & Stilettos fan. How fabulous is that! I am so excited and I really hope you win. Here is the scoop. What I love about the PLUSH show is that is features so many of my favorite companies including Layla Grayce, PetitNest, Bebe Au Lait and Project Nursery just to name a few. It is the best party in town for moms who want nothing but the very very best for their little ones. On top of that you will get a chance to rub shoulders with some of your favorite celebrity moms…. So if you consider yourself a chic modern mommy and you want to join the girls for a great afternoon – you can purchase tickets for as little as $20. Attendees will receive wonderful swag bags so you can get a taste of the best baby products and services on the market. I also love the fact that 10 percent of all proceeds go to Generosity Water – an organization dedicated to ending the clean water crisis in developing countries, one community at a time. All children deserve access to clean water and it is cool that these companies are trying to help. Now back to the FREE Petunia Pickle Bottom Diaper Bag...Here is what you need to do to enter. And I forgot to share the details – the event will be on Sunday, June 5, 11:00 am – 4:00 pm at the Vibiana in Los Angeles. Now go and enter to win the bag!! And tell your friends too…. I told you the place is super cute – here is a little peek. I love the purple walls and the furniture too! Anyhow – here is the scoop. Mention Sweet Peas & Stilettos and you get a very special 2 for 1 offer. A parent can bring a child in for a play date, and they can get a second play date free, or if a parent comes in with 2 kids, one child’s play date will be free. So treat yourself and your kids – you deserve it! For a current schedule and more play date details check out the “Parties” section of the SweetHarts website. To reserve your spot for any play date, please RSVP: email: sweethartssweets@gmail.com or phone: 818-788-5004.